You can change the date, time, and duration format for Hubstaff. This will help you customize your dashboard to fit your preferences. We provide a variety of different ways to display this information. The date format will change the way that the date is viewed on your Hubstaff account. There are five different ways that the date can be viewed. The time format will change the way that the time is displayed on your Hubstaff account. There are four different ways that the time can be viewed. 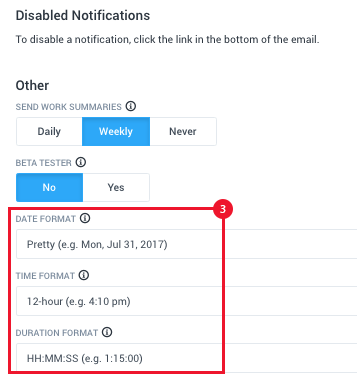 The duration format will change the way that time duration will be displayed on your Hubstaff account. There are three different ways that the duration can be viewed. Click on the menu with your avatar icon. Next, you’ll want to click on Settings. This will open up your settings page where you can view the setting for changing the formats. Click on the setting preview to change the preferred setting.